The dynamic ease of Fred and Ginger’s partnership was unparalleled. They were complete naturals from the start. Their first on-screen collaboration was in Flying Down to Rio, a 1933 musical where they played supporting roles to Dolores del Río and Gene Raymond. At face value, the mileage of Astaire and Rogers as supporting cast was relatively obvious. Ever since he first came to Hollywood, Astaire wasn’t exactly “leading man” material; the infamous RKO screen test read: “Can’t sing. Can’t act. Balding. Can dance a little.” Rogers’s trajectory was a little different. She had excelled in vaudeville and Broadway, but when it came time to climb the studio system, she was never the beautiful and slinky leading lady. The Gay Divorcee established the dominance of the dancing duo in a way that set the format of musical films for the next half-century. Gone was the extravagant, nosy reign of Busby Berkley and visual overstimulation – audiences craved the dignified elegance of Fred Astaire’s swaying limbs and Ginger Rogers’s tap-dancing ferocity. They moved with one mind and their chemistry was undeniable. Starting with Astaire and Rogers, the dancing became the calling card of the musical, the songs were written specifically for the films (and most became pop standards of the American Songbook), and the intimacy of the choreography was that much more pronounced. 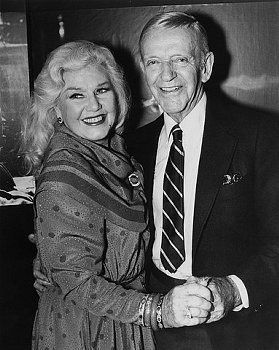 It is easy today to mistake Astaire and Rogers for two old-timers who danced pre-Chubby Checker without any personality, but upon closer inspection, you could not find a greater contrast in a duo. Fred Astaire was the lithe gentleman, swooping and swaying with aristocratic grace, while Ginger Rogers was always the energetic whipper-snapper trying as she might to evade his charm. There is pure romance in an Astaire-Rogers film that pushes away anything that might spoil the innocence of its refinement. There are no sexual overtones, no pursuing aggressions, or cynical sentiments. In his top hat and tailcoats, all of Astaire’s tap-dancing is only ever to win one thing: a kiss. Even then, the kiss was ultimately never the prize, but the journey – the dancing – was. Take a look at this scene from The Gay Divorcee. It’s so simplistic in its execution, but the sublimity says it all. Rogers’s expression remains coy throughout the number, restraining her emotions to mere darts of the eye and head tilts, but Astaire sings Cole Porter’s Night & Day with such stylish yearning that Rogers can’t help but counter his moves, and before she knows it, they’re dancing in sync. Partnership was not something that Astaire expected to carry on. He had danced with his sister Adele all his life and wanted to make a name for himself. “This ‘team’ idea, it’s ‘out’!” he proclaimed to his agent. But people loved him, and he loved Rogers. She was not a trained dancer, but she had the rare quality of professionalism that made her exceptional in any field she put her mind to. Unlike Astaire’s subsequent partners, Ginger never once complained or cried over his tireless exactitude. In Top Hat, the Cheek to Cheek dance is slow and gentle. Astaire leads Rogers through emotional footwork. She follows his lead, gliding across the floor, letting him indulge her with melodies, and she takes it all in. When Astaire twirls around Rogers, she follows him in an almost seductive trance. When he dips her, she tilts her head down in a kind of evocative pleasure. A more assertive, kinetic energy is seen in Swing Time, when Astaire takes Rogers and has them putting on a show for her boss, played by Eric Blore. It’s an elaborately romantic gesture, one full of kindness and charm. Despite her indignity at his lack of professionalism in the film, he manages to bring Rogers back to a positive light – a pleasant surprise for Rogers’s character, who starts her journey toward falling for Astaire. Here, they mostly work independently of one another, but the tactical precision of the tap shoes is a sight to behold. There’s a confidence in them that has never been replicated by any other dancing duo in film. There’s no question the history of dance in cinema began with Fred Astaire and Gingers Rogers. It was the harmonious unity of their dedication that made audiences fall, not for the two individuals, but for the partnership. Ginger wasn’t a dancer, but she looked like one, and acted like one…so much so that real dancers began looking like phonies. Fred wasn’t a natural actor, but playing off Ginger reminded audiences what kind men should strive for. They made 10 films total, 9 for RKO Pictures and 1 for MGM. Time has been sweet to Fred Astaire and Ginger Rogers. Their brand of musicals became timeless, elegant, classy affairs. Their relaxed rapport made for lavish splendor. Songwriters like Cole Porter, Irving Berlin, Harry Warren, and Ira Gershwin clamored to write for them. Some composers found fame through their pictures, and their songs have become classics through the gentle croons. To read the other blogposts celebrating great movie partners please click here for Day One and here for Day Two. Please follow Dynamic Duos in Classic Film Blogathon co-hosts Once Upon a Screen & Classic Movie Hub! I don’t think there’s a soul out there who won’t want to visit this tribute. Who doesn’t love Fred and Ginger? And you do them great honor. Their entry into the partnership reminds us that the first impressions thing is way overrated. 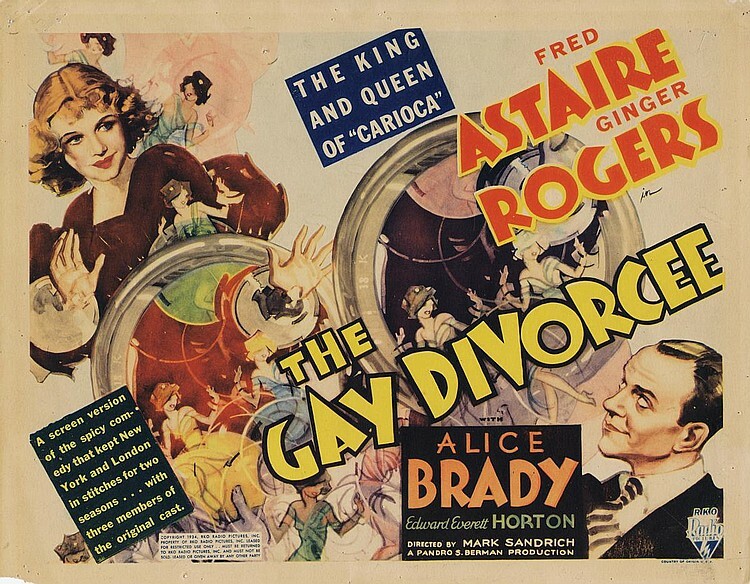 The Gay Divorcee is my favorite of their pairings because I think it’s the funniest, but the two never missed a beat and the added attraction of the great character actors in their movies make each outing legendary. Needless to say this is a fantastic choice. Thank you so much for joining us for the blogathon. Glad to be a part of it, Aurora. It wouldn’t be the same without Fred and Ginger. One of the most airtight partnerships in cinematic history. Truly a masterful duo!!!! Great read!!! Thank you so much! Love your Dynamic Duo choice too. My favorite singers! Time passes between viewings of their movies, and then I am enchanted all over again by the delights to be found watching Fred and Ginger. Time passes and then it stops because Fred and Ginger are timeless. Thanks again for reading, Patricia! I adore Fred Astaire and Ginger Rogers. Top Hat was one of the earliest musicals I ever saw. There was a real magic in their partnership. It was obvious when they first appeared together in Flying Down to Rio and it is still obvious today. A kind of magic that only they could have provided. Thanks for reading! I love these two. Swing Time, in particular, is a joy to watch! It’s a toss-up between “Swing Time” and “Top Hat” for me, but Astaire’s personality in “Swing Time” totally takes the cake. I liked your description “dynamic ease”. Perfect! I have so much fun with their films that I can never pick a favourite. Every time I see one of their movies, I think, “THIS one is my fave.” But then I watch another one, and THAT becomes my fave.